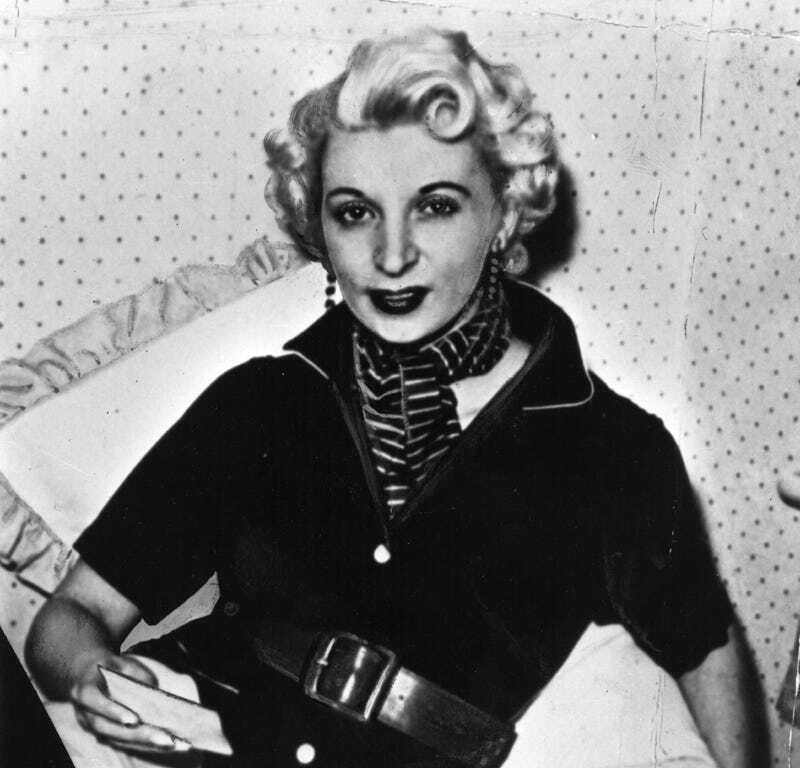 Ruth Ellis had a difficult life leading up to the night she shot her on-and-off boyfriend, David Blakely, in 1955. Variously described as a “model” and “nightclub hostess,” she was literally apprehended holding a smoking gun, and refused to alter her bleached-blonde locks to make a good impression during her trial. Though she confessed to pulling the trigger outside a London pub (and witnesses saw her do it), there was something about the petite Ruth, who was just 28 at the time of the murder, that captivated the public. Her cause attracted so much attention and inspired so much debate that no more women were executed after her death on July 15, 1955, which came via the rope of prolific hangman Albert Pierrepont. Born in 1926, she left school at age 14 and soon after gave birth to the first of two children, not realizing her new son’s father was already married to another woman. Later, she had a daughter after marrying a man of some means who was nearly 20 years her senior. But he was abusive, and the relationship was short-lived. With her mother taking care of her children, Ruth adopted her signature platinum locks and landed a job at a nightclub. There, she met David Blakely, who was from a wealthy background but had lived a similarly unstable life. It was a volatile partnership that seems to have hinged more on passion than anything else. Neither was faithful to the other, and Ruth had a second suitor in the form of Desmond Cussen; she moved in with him and, it was later alleged, it was he who gave her the gun she used to shoot David, and had even driven her to the scene. From the moment of her arrest, she was questioned only by men: policemen, solicitors and barristers. It is difficult to escape the conclusion that they all allowed themselves to be swayed by class prejudice — the fact she was a former nightclub hostess while the man she’d murdered was from a well-respected and wealthy family. Her anger and despair were often referred to as ‘hysterical’, when the often unhinged behaviour of the two most prominent men in her life — David Blakely and her former husband George Ellis — was never described in such terms. Ruth’s leading defence barrister, Melford Stevenson QC, had almost no criminal law experience and little sympathy towards women. After a brief trial, the jury took just 14 minutes to find her guilty, and she didn’t appeal the decision. As the date of her execution approached, thousands signed petitions urging mercy for Ruth. Ruth Ellis’ family campaigned for her murder conviction to be reduced to manslaughter on the grounds of provocation. Through the Criminal Cases Review Commission they brought the case to the Court of Appeal in September 2003. They argued Ellis was suffering “battered woman syndrome”. She had suffered a miscarriage just 10 days before the killing after David Blakely had punched her in the stomach. But the appeal judges ruled she had been properly convicted of murder according to the law as it stood at the time. The defence of diminished responsibility did not then exist. Ruth’s son, who was 10 when she died, committed suicide in 1982; her daughter, who spent much of her life trying to clear her mother’s name, died of cancer in 2001. In 1965, the death penalty was suspended in the UK for both men and women, and done away with for good in 1970.